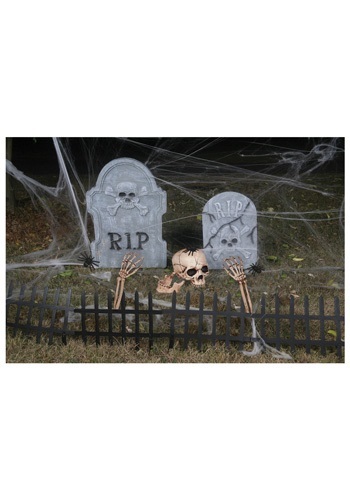 Get ready to turn your front lawn into a graveyard this Halloween with this Cemetery Kit. The kit includes two styrofoam tombstones which have four plastic stakes (two per tombstone). These plastic stakes are used to stick the tombstones into the ground. The skeleton jaw, head, and arms can be placed in front of the tombstones in any way you'd like. The skeleton jaw and head can be connected to make a full skull or kept separate if you like. There is also a bag of spider webs that can be positioned on the tombstone, skeleton, and fence along with the three plastic spiders. Finally there are four plastic fence pieces that can be placed standing in the ground in front of the skeleton and tombstones. This kit will get you set to terrify your neighbors!